Our last day in Georgia, we slept in and got ready to go at a leisurely pace. 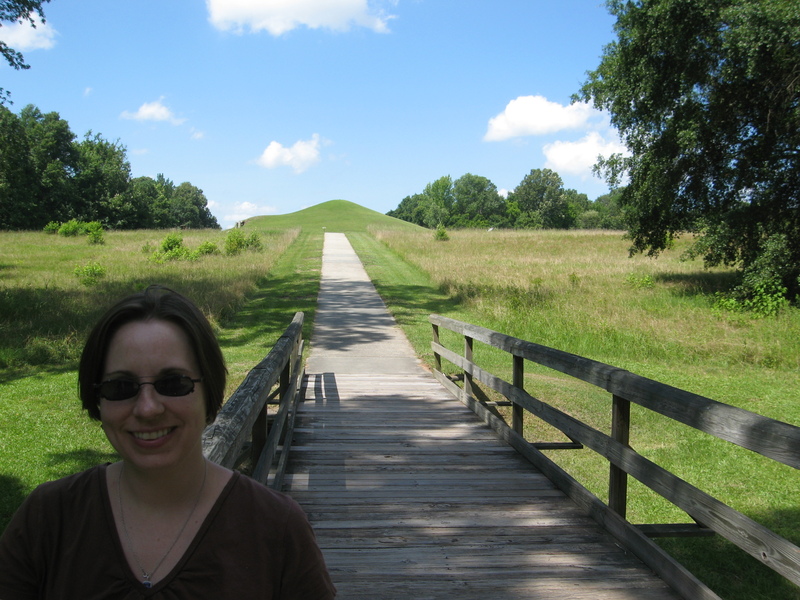 We didn’t have much in the way of a “must-do” itinerary, so we decided we would visit the Ocmulgee National Monument, which is a site that preserves another group of Indian Mounds. In addition, there is evidence of over 17,000 years of human habitation at the Ocmulgee site. The Visitor’s Center there was started in the 1930s, in the Art Deco style, but due to World War II it wasn’t completed until 1952. Inside there is an exhibit featuring artifacts that have been found on the site and displays about the tribes who once inhabited the land. We walked outside from the Visitor’s Center and first we came upon an Earth Lodge in a mound; it is at the site of the oldest Ceremonial Lodge in the Americas. The Earth Lodge was found in ruins and reconstructed on the same site, using evidence they found from the ruins. The floor is the original floor, constructed by the Ocmulgee people in 1015 A.D. You enter through a tunnel the way the Native Americans did. I had to stoop to go through the tunnel and they have even raised the height of the tunnel during the excavation and preservation of the lodge! For reference, I’m 5’3″ tall, so these must have been some very short people! Inside, the Earth Lodge would have seated about 50 people and there were seats molded into a platform for the leaders to sit. Further on you come to 3 more mounds; 2 are ceremonial mounds and a third is a burial mound. The walk isn’t that far, but you can drive to all 3 mounds if you aren’t inclined to walk. The tallest ceremonial mound on the site is 55 feet tall. Scans of the tallest mounds have revealed that this one had a spiraling staircase leading to the top. 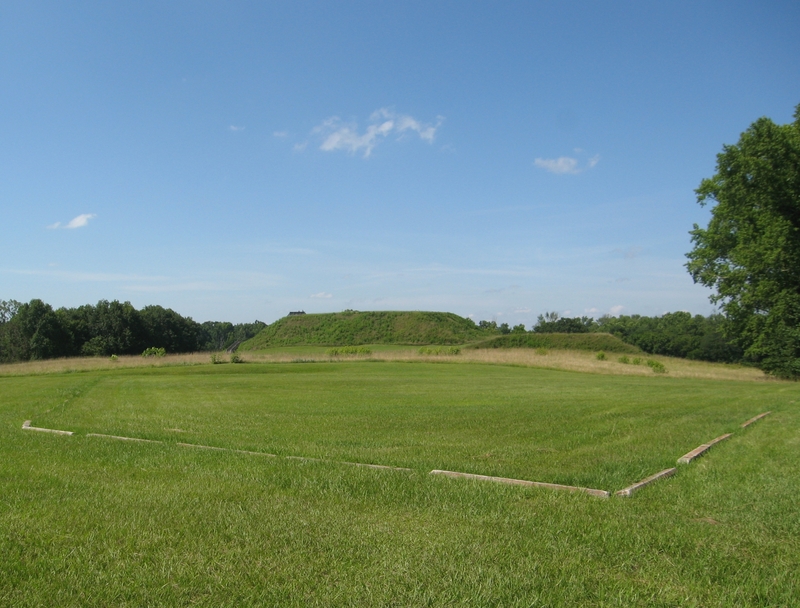 The site is also unique because the mounds were built a bit further away from each other than other mound sites – scholars believe that this was to provide additional space for public space and residences around the mounds. Sadly, one of the ceremonial mounds was sheared in half in 1843 when the railroad came through. Further damage was done in 1874 when the railroad cut was widened substantially, destroying a large portion of the funeral mound. The railroad line still runs through the site today, and when you are walking, you actually cross over the cut on a pedestrian bridge. It makes me wonder how many historical artifacts were carted off by railroad employees and construction workers of the day. I’m glad that there is a bit more awareness of the need for historic preservation today. If mounds aren’t quite your speed, archaeologists have also found Clovis Points on the site, which date back about 13,500 years. Clovis people used the points to hunt for game, and they have been found at sites all around North America. It is pretty neat to think that this site has supported human life for so long. Also on the site of Ocmulgee National Monument is a plantation house, which used to be the house for the Dunlap Plantation. The Civil War battle of Walnut Creek was fought near here, and the Confederates built an earthworks in the yard of the Dunlap house that remains today. We walked to see the earthworks, which are entirely unexciting, but you have to imagine what it was like 150 years ago. Given the heavy cannon firing during the battle of Walnut Creek, it is hard to believe there weren’t more casualties. The Confederates had 1 killed and 2 wounded, while the Union had 9 wounded. This was a lovely stop to explore a part of US history that I didn’t know much about, plus I got some more stamps for my National Park Passport! After Ocmulgee, we made the drive back to Atlanta, and Jon found an independent record store he wanted to visit. He would have to tell you about his experience himself (he was like a kid in a candy store! ), because I find it difficult to entertain myself in indie record stores. 99% of the music they carry is stuff I have never heard of. Let’s just say I like more “commercial” music. But Jon was happy, so it was a nice ending to a great trip! We headed to the airport, got checked in, went through a terribly long, slow line at security, and finally got settled in for the long flight home. Although I had a fantastic time the whole trip (well, except for that one fight during the traffic jam…), I was ready to sleep in my own comfy bed. Of course, after a couple days back at home, I was ready to travel again! Now we just need to save up for the next trip! 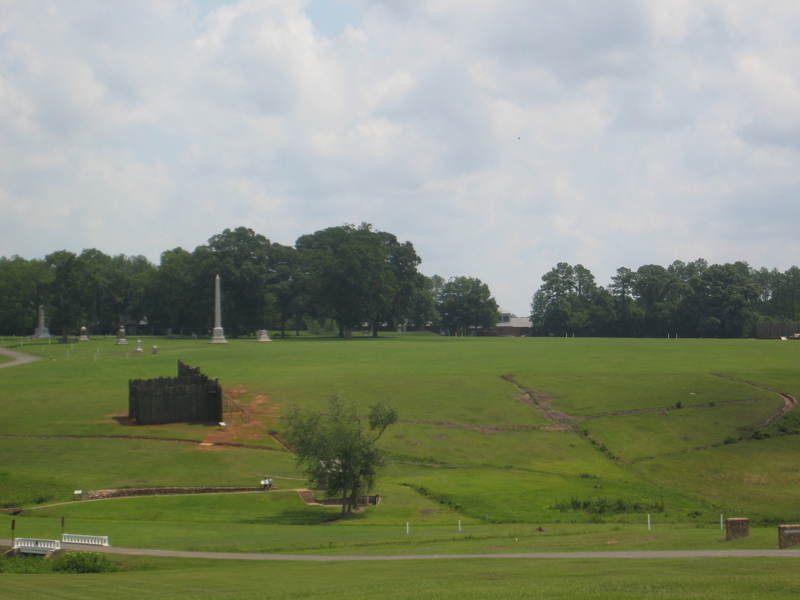 After we visited the Andersonville Prison, we drove over to the other side of the Andersonville National Historic Site property, which is home to Andersonville National Cemetery. 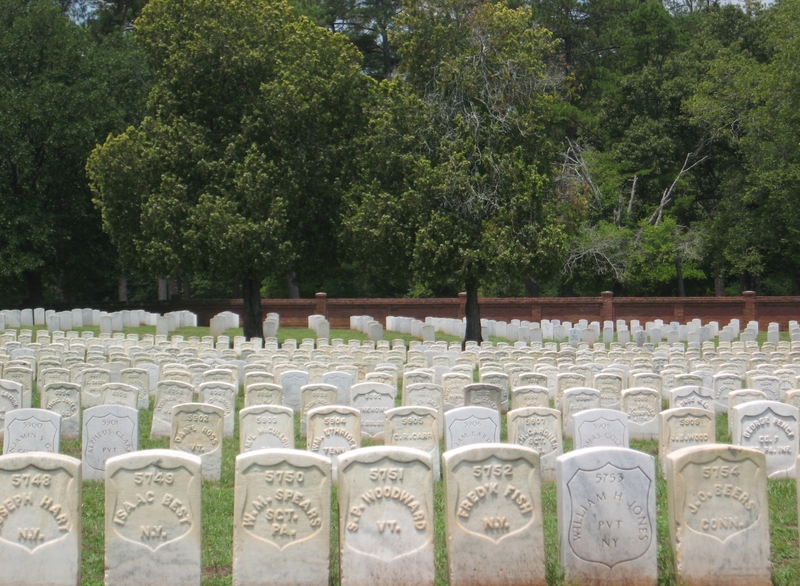 The cemetery was born in February 1864 with the first graves of 12,920 Union soldiers who would eventually die at Andersonville Prison, and it continues to accept new burials of service members today. In the cemetery, the graves of the Andersonville prisoners are much more tightly packed together than in a typical cemetery. The deaths were occurring with such frequency (close to 100 prisoners per day during the summer of 1864) that they buried the dead in trenches, shoulder to shoulder, instead of in individual graves. Each grave was marked with a simple wooden marker and a number. Dorance Atwater, a Union POW at Andersonville, was responsible for keeping the list for the prison matching the grave numbers with the names of the dead. He sat next to the camp commander, Henry Wirz. He took a risk and kept a separate list of the dead and their grave numbers, because he was concerned that the official list he kept for the Confederates would not be turned over at the end of the war. As it turned out, his concern had some merit. After the war, Dorance Atwater smuggled his list out of the prison and took it to the U.S. Government, which shockingly, didn’t pay much attention. So, he went to the press and his list was published by Horace Greeley, who had founded the New York Tribune. The attention the story received put Atwater in touch with Clara Barton, who ran the Office of Missing Soldiers in Washington, D.C., and later founded the Red Cross. Clara Barton organized a detail to match the grave numbers with the names of soldiers who had died, and Dorance Atwater went back to Andersonville in the summer of 1865 to help. 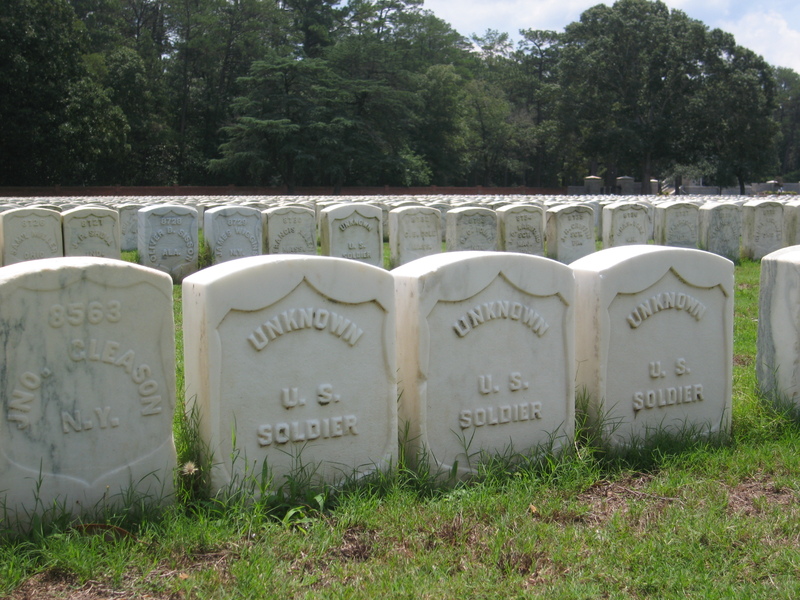 Thanks to his list, only about 400 of the Andersonville prisoner graves are unidentified soldiers. The detail that summer marked all of the graves that they could with a wooden marker containing the names and states of the soldiers who occupied them, and marked ‘Unknown Soldier’ on those few that they could not identify. All of the graves are now simple marble, carved to replace the original wooden markers and placed in 1898 and 1899. All of the markers are the same, except one. 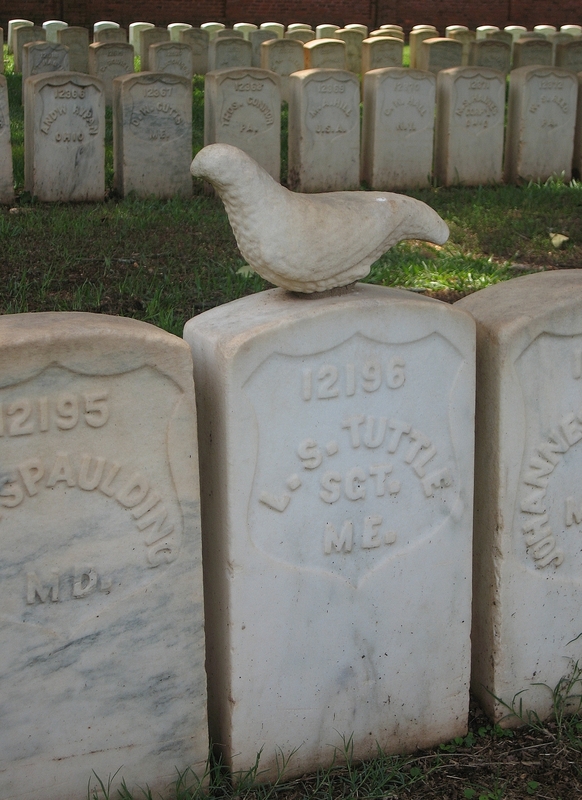 The grave of Lewis Tuttle, a Sergeant from Maine, is adorned with a stone dove. Nobody knows who placed it there, or when. It is one of the enduring mysteries of the cemetery. But clearly, Sergeant Tuttle was loved by someone. The cemetery today is peaceful, like the prison site, and has many beautiful shade trees and low brick walls. The day we were there, there was a service, but the cemetery is large enough to walk around and not feel like you are disturbing the service. The audio tour we got back at the Visitor’s Center offers a great history of the cemetery and who is buried there, with stories of brothers and heroes, both during and after the Civil War. Andersonville was our one activity for the day, and you can read about our visit to the Andersonville Prison site here. After our visit, we headed out on the way to our stop for the night, Macon, Georgia. We stayed at the LaQuinta there, which had a pool! And a million high school baseball players. We got there at about 3:30, so we had some time to lounge by the pool for awhile before we needed to go find dinner. For dinner, we went downtown and stumbled upon a café, La Dolce Vita, which had a great tomato and red pepper bisque and a decent Calzone. Jon had a turkey wrap and an Avocado Salad topped with crab. Delicious! After dinner, we headed back to the pool for a bit more pool time on our last night in the South. We got up and while I got ready to go, Jon enjoyed some time down at the exercise room at the Windsor Hotel (he did say it was too hot though). Then we checked out of the hotel and since the hotel restaurant was almost done with their breakfast period, we asked where else there was to get breakfast in the area. The manager recommended Carter’s, which he said served an authentic southern breakfast. We checked it out. It turned out to be Carter’s Fried Chicken, and they did have a breakfast menu. I’m not exactly sure I would describe it as authentic though – or at least authentic southern breakfast isn’t much different than all the authentic northern breakfasts I’ve had. Scrambled eggs, sausage, Wonderbread, and substitute grits for hashbrowns. Carter’s breakfast was decent but nothing fancy, cafeteria style, served up on a Styrofoam plate with plastic utensils. But it filled us up and we were on our way. Like I said before, our destination for the day was Andersonville, the confederate Civil War prisoner of war camp. It was called Fort Sumter during the war, but in the later years it became known as Andersonville, named after the closest community. It was located there because it was sufficiently remote as to prevent much chance of a Union raid on the camp, and the community of Andersonville only had about 20 residents during the Civil War, so there wasn’t much chance of their complaining too loudly about having a POW camp in their backyard. We got to Andersonville close to 10:30 in the morning, and went to the Visitor’s Center. 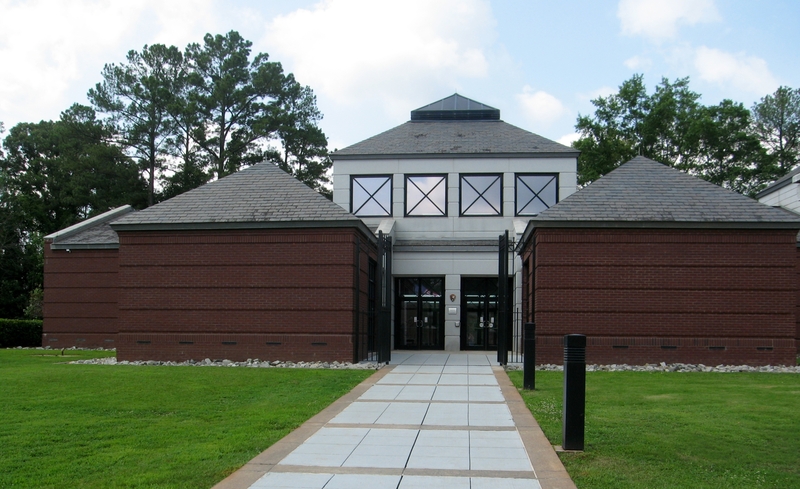 The Visitor’s Center has a museum honoring Prisoners of War from all conflicts that the U.S. has been involved in, from the Revolutionary War to the present. We started out by watching their half hour film from the perspective of POWs. It was a very powerful collection of interviews with people who were POWs going back to World War II, detailing their experiences, both the horrors they lived through and the joy they experienced upon their release. The museum there is well done and offers a lot of information on the POW experience throughout the ages. It is a National Historic Site (and I got a stamp! ), and it is all free of charge! They do welcome donations, for the fantastic work they do to preserve this history for future generations. After the film and our visit to the Museum, we checked out the free audio tour from the Visitor’s Center and headed out to see the prison site (just ask for the audio tour at the front desk). The audio tour has a tour of the prison and the cemetery, so you can head over to the cemetery after you are done with the prison and get some good information there too. I’ll talk about the cemetery in my next post. Fort Sumter was located in this remote area of Georgia to prevent Union troops from being able to easily mount an assault on the prison to free the POWs. 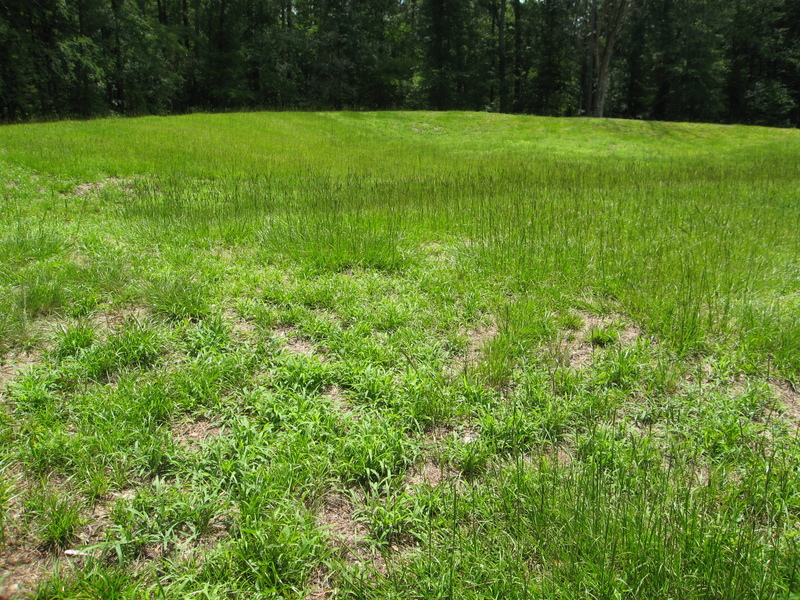 The site was originally 16.5 acres, with a boggy creek running through it to provide a water source for prisoners. The camp was designed for about 6,000 people. A few months after the prison opened in February 1864, officials realized that the original 16.5 acre site was not large enough, and the camp was hastily expanded to 26.5 acres. Unfortunately, there was no new source of water in the expanded area. The expanded prison was intended for about 10,000 prisoners, but by June 1864, there were about 26,000 prisoners housed there. At the height of overcrowding, the population was 32,000 prisoners. In all, 45,000 prisoners passed through its gates in the 14 months that it was open. During construction of the prison, officials reasoned that prisoners could access the upstream area of the creek for drinking water, and use the downstream portion for their latrine. What the officials didn’t count on, however, was that the water had already been tainted by kitchen facilities upstream, so the water was polluted by the time it ran into the camp. 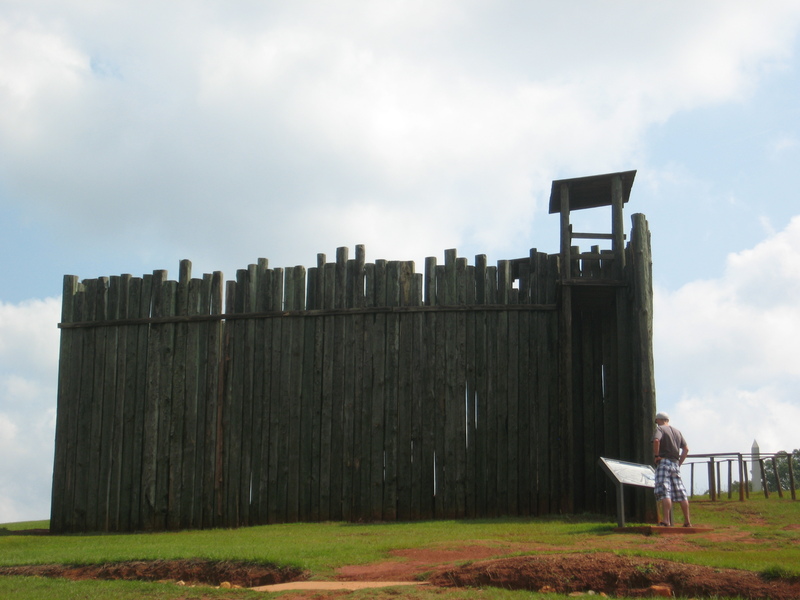 So much for that idea… The camp was constructed with a stockade wall and guard towers built along the wall for guards to monitor the prison population. 19 feet within the stockade wall was a light fence that became known as the ‘deadline’, because if you were seen on the other side of that fence, you would be shot on sight. Therefore, of the 26.5 acres of the camp, a significant section of the real estate was not even available to the prisoners. When the Confederates were building the camp, they cut down all the trees that were on the site, both to use for the stockade walls, and to prevent the prisoners from being able to use the trees as cover for an escape. The unfortunate consequence was that there was absolutely no shelter from the elements on the camp grounds. Prisoners could use whatever they could get a hold of to build a shelter for themselves, but there were not a lot of available resources. As we drove around the site and got out of the car to explore more, it was apparent that this camp would have been unbearable in the hot summer sun. And it would only get worse as the summer got hotter. And the Georgia winter would not have been pleasant either, dressed in rags with no shelter and inadequate food. Due to a combination of polluted water, inadequate food and nutrition and lack of shelter from the elements, prisoners began to die in large numbers shortly after the camp was opened. 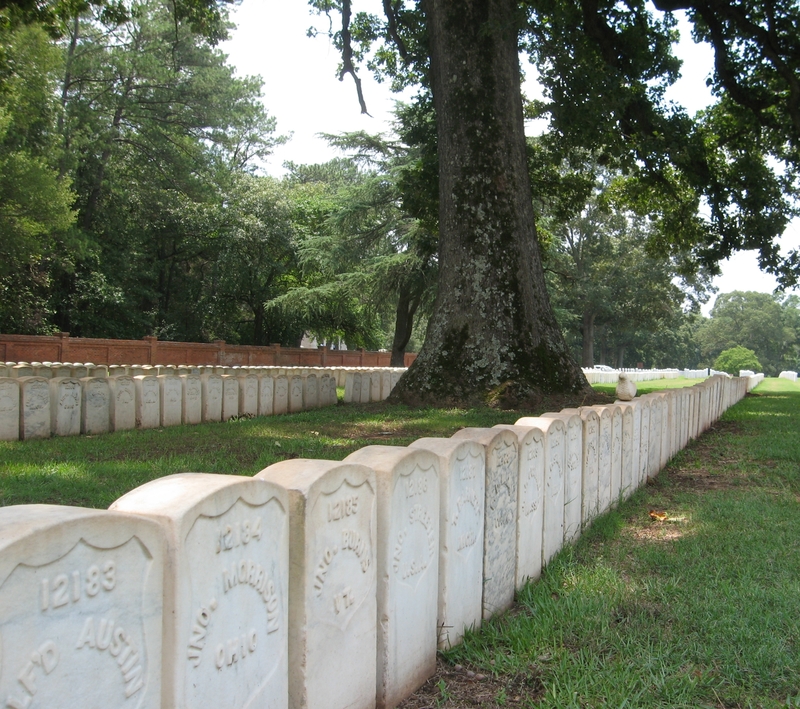 In all, almost 13,000 of the 45,000 prisoners at Camp Sumter died during the 14 months that the camp was operating. 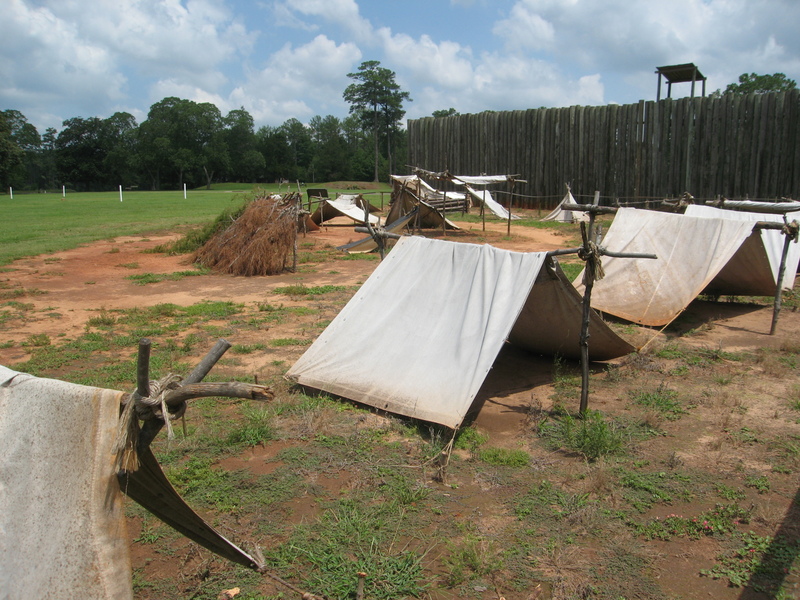 If you were lucky enough to be healthy for awhile, you still had to contend with the Andersonville Raiders, a gang of immoral prisoners who weren’t above using theft and violence to obtain additional resources for themselves. They were armed mostly with clubs, and would steal food and valuables in order to survive – killing the weakened soldiers who tried to resist. Eventually in July 1864, the Andersonville Raiders were captured by their fellow prisoners, and the camp commander Henry Wirz allowed the prisoners to arrest and try the Raiders, sentence them and carry out their sentences. Sentences ranged from minor punishments like being put in stocks, to more severe punishments such as running the gauntlet – I had to look this up – it is where you have to run back and forth between two rows of soldiers while they strike you with clubs or sticks as you run by. Apparently some of the Raiders who were made to run the gauntlet got off with only a few blows to the head, but a couple of them were beaten so badly that they later died of their injuries. Six of the Andersonville Raiders were hanged. The prisoners refused to allow the Raiders to be buried with the rest of the prisoners who died honorably, so the Raiders’ graves are separated in the cemetery from the rest. At least after the trials and punishments, prisoners didn’t have to worry about being victimized by their own fellow prisoners. I’m sure it was small comfort. As the situation with the water got worse, prisoners prayed to God and were blessed with a natural spring that was unearthed in August 1964 by a lightning strike during a torrential thunderstorm. 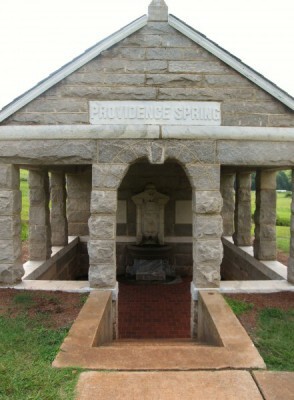 Providence Spring, as it came to be called, had cool, clean water that flowed at the rate of about 10 gallons per minute, enough to provide enough clean water for everyone in the camp. It continues to flow today, and it is now enshrined in a granite building. Ironically, park rangers have marked the spring as having unpotable water – I’m not sure if that is just to limit liability, or because the structure contains lead pipes, or because the spring has been polluted now too. I didn’t test the waters, so to speak. Sadly, although Sherman’s troops were within about 20 miles of Camp Sumter during their March to the Sea, the prisoners were not liberated at that time. In fact, they had to endure another miserable winter (1864) and were not released until April 1865 when the war ended. Although conditions had improved somewhat, it was still considered a horrific experience. Henry Wirz, the camp commander, was the only ranking officer who was executed for war crimes after the Civil War. People were outraged when word reached the north at the end of the war about the conditions the prisoners were subjected to. Lincoln had just been assassinated, and there was not a lot of sympathy for Wirz’s claims that he had done the best he could with the resources he had available. To Wirz’ credit, he had sent a letter signed by many of the prisoners requesting that the North re-establish prisoner exchanges, but the Union would not. At one point, the Confederates even offered to release the prisoners, if only the Union would send ships to the Georgia coast to pick them up. Ironically, New York’s Elmyra prison had a similar death rate among the Confederate soldiers who were imprisoned there, but the South was in no position to punish the North, having lost the war. I also learned that many of Andersonville’s prison guards suffered the same malnutrition and exposure to the elements as the prisoners, and many of the guards died too. You can draw your own conclusions about whether you believe that the Confederates intentionally starved the soldiers, or if was a cruel result of the circumstances of the time, with even Confederate soldiers and citizens going hungry. Andersonville prison and cemetery is now a very peaceful place. I wrote about the cemetery in a separate post; you can find it here. While we were there, we saw only about a half dozen others touring the grounds. Actually, I was surprised that there were so few people there. On the grounds – it is very quiet; you can only hear the sounds of nature – there are no sounds of traffic, industry or city life. If you didn’t know what happened here, you would never be able to guess that a place that seems so serene now could have been the site of so much pain and suffering. It was a humbling place to visit. Last Saturday night Jon and I had the good fortune to go to a showing of the movie The Mountain Runners. It is a film about a crazy marathon event held for a couple of years after the turn of the last century here in Bellingham. It was the crazy dream of the Mount Baker Club, a club dedicated to promoting outdoor activities. The Mount Baker Club was in its infancy in 1911, having just been formed, when they decided to hold an event that they hoped would promote tourism to Mount Baker, the 10,781 foot peak in the backyard of Bellingham. As the crow flies, Mount Baker is just over 30 miles from Bellingham. On today’s road, with switchbacks for the ascent, the distance is about 60 miles. 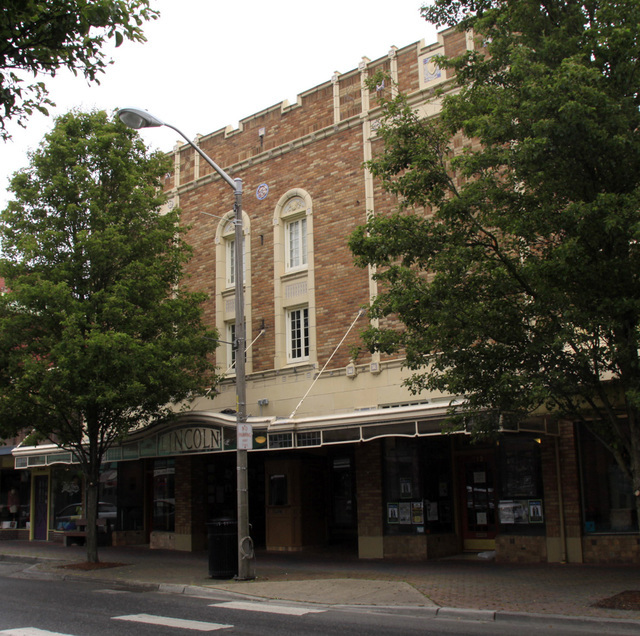 The film was showing at Mount Vernon’s Lincoln Theatre, which is an independent historic theatre built in 1926. It is neat to take a step back in time, and see the fully restored beauty. The Lincoln was built as a vaudeville and silent movie house with a Spanish motif. It has beautiful and simple wrought iron light fixtures and wall coverings in what’s known as a travertine finish. It makes large use of reds, yellows and blues. It’s a bit plain on the outside, but if you appreciate historic architecture and design, you won’t be disappointed by the interior! So here was the plan. The Mount Baker Club would host a race, where men would depart from Bellingham, make their way to the summit of Mt. Baker and back to Bellingham, all within 24 hours. There would be two routes to choose from, one where you made the initial 44 miles (one way) of the trip by train to the small town of Glacier, and then ran the remaining portion of the trip to the summit (about 28 miles round trip on foot). Or you could opt for route two, where you were driven from Bellingham 26 miles (one way) to another small town, Deming, where you began your journey on foot to the summit from the other side of the mountain. This route’s round trip run was about 32 miles (but supposedly the trails were a little better in this direction). Once you arrived back at your vehicle (either car or train) after your run, the vehicle took you back the other way into Bellingham. The first man to arrive won. Simple right!? Except that even in the height of summer, the highest portions of Mount Baker still have about 20 feet of snow pack. And the temperature at the summit is generally 35 degrees colder at that altitude. So, even if we are having a pleasant 70 degree day in town, it will be about 35 degrees at the top of the mountain. That’s if it isn’t storming… And these men, in their race to be the fastest, didn’t want to stop and put on mountaineering gear. Nope, they were making the summit climb in simple cleated logging boots. Yikes! In 1911, the first year of the race, Joe Galbraith took the win with the Deming route in 12 hours and twelve minutes. 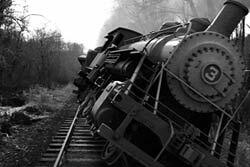 But only because Harvey Haggard’s train, while speeding back to town, collided with a bull and derailed! Up until the derailment Harvey Haggard was in the lead. Newspapers of the day sensationalized the story quite a bit and announced that 3 men died in the crash, but in fact, there were only minor injuries. I think Harvey Haggard should have gotten a special prize, for continuing his journey in a horse drawn buggy, then on horseback, and then in a car. In fact his horse spooked when it saw the waiting car and stopped short, sending Harvey sailing over his front end. Even after fainting twice on the car ride back to town, Harvey Haggard still finished second. The bull didn’t fare as well. He was killed by the train wreck, and BBQ’d up by the townspeople to celebrate the race. In 1912, Joe Galbraith was going to defend his title, but ended up breaking his arm a few weeks before the race and having to withdraw. Harvey Haggard won this time, without the high drama experience of the year before. In 1913, race organizers had come to understand that barring any train derailments, the Glacier route was faster, so they switched things up a bit. If you took the train up the mountain, you had to take the car down, and vice versa, to even the odds. But 1913 barely averted tragedy again. One of the racers, Victor Galbraith, cousin of Joe, fell into a crevasse on his way down from the summit. Miraculously, he survived the fall, but almost died of hypothermia (remember they aren’t wearing mountaineering gear) as he waited 5 hours at the bottom of the crevasse to be rescued. 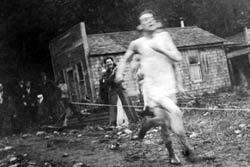 After the 1913 race, organizers realized that it was only a matter of time before something went horribly wrong. There were other issues of mismanagement on the part of the race organizers too, but I won’t go into them here. The race was ended for good. Or so you thought! In 1973, the Mount Baker Marathon was reborn as the Ski to Sea Race. I’ve blogged about it here, earlier this year, when Jon participated in the running leg of the race. It’s nice to see a local independent film make its way in the world. If you can, it is worth seeing – and if you aren’t from the area, check out the website, because it is getting some national and international viewings! The Grand Tour – Day 7 – Americus, Georgia! After Fort Pulaski, we got on the road to our next destination – Americus, Georgia. 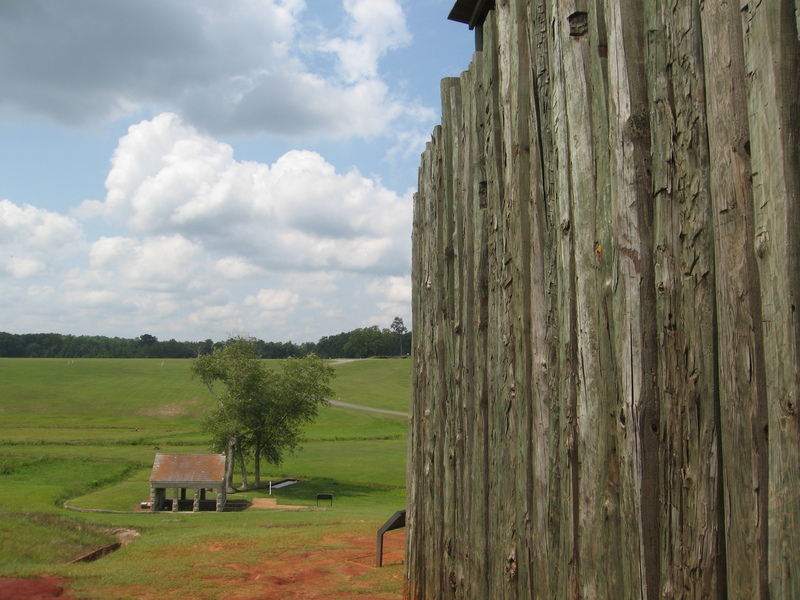 Americus is a small town of about 17,000, which is only about 10 miles from Andersonville National Historic Site. Yes, the Andersonville of Civil War Prisoner of War camp fame, which was to be our destination the next morning. The long drive was a collection of boring freeways and picturesque back roads. We passed lots of cute brick homes with front porches, lots of singlewide trailers, a Mennonite Church, and one house that appeared to have been struck by a tornado. The entire front half of the home was sheared away, and there was furniture and debris all over. It made me glad we don’t have very many tornados in the Northwest (although we do have a few). Once we got to Americus, we checked into our home for the night, the Best Western Windsor Hotel. The Windsor is a historic hotel, built in 1892 to attract folks from the north who wanted to winter where it was warm. It originally had 100 rooms, but after the renovation, it has 53 guest rooms, none of which are alike. 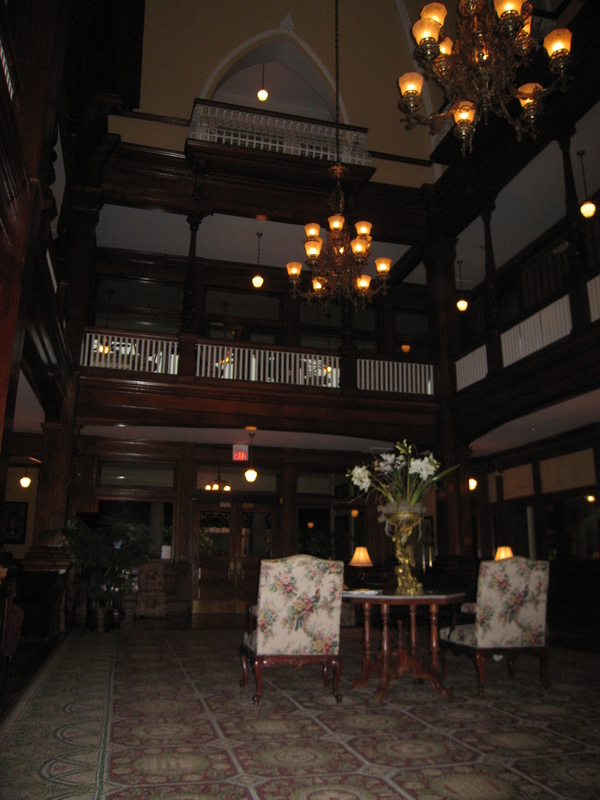 The hotel has a grand 3 story lobby, and you can walk around the landing on the upper floors and look down at the lobby. Lots of famous people have stayed there over the years, including former President Franklin D. Roosevelt, Eugene Debs (the labor leader), Jessica Tandy and former President Jimmy Carter and his wife. 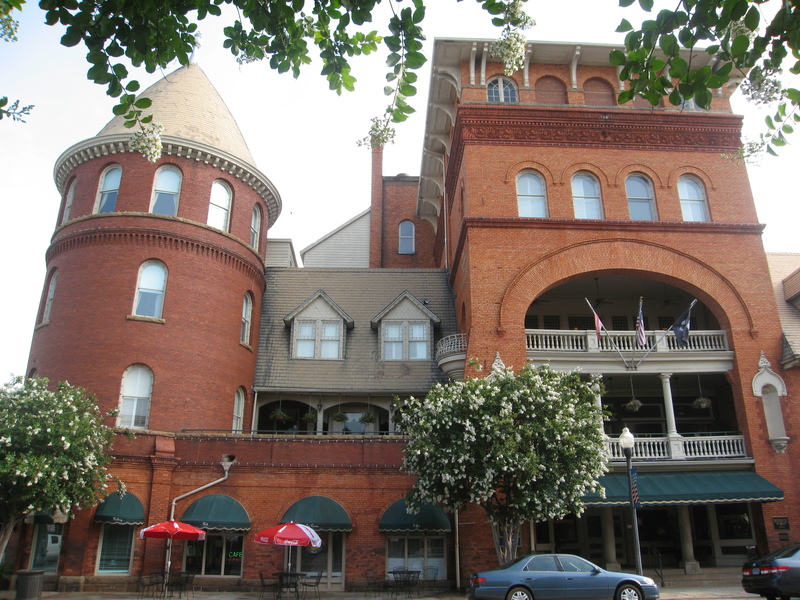 The hotel is listed on the National Register of Historic Places too. Rumor has it that Al Capone also stayed there, and had an armed guard posted at the base of the turret suite where he stayed. And it has some ghosts. Floyd Lowery was a doorman who worked at the hotel for over 40 years and is still around. Apparently he is a friendly ghost, still wanting to serve the guests who see him. Although Floyd didn’t drink, the pub at the hotel is now named for him. And a woman and her daughter were murdered in the early 1900s, pushed down the elevator shaft from the third floor. It is said that the woman’s reflection can be seen in the mirror in the hallway of the third floor, and the little girl can be heard running up and down the hallways playing. We didn’t see or hear anything in our third floor room, although it was on the opposite side of the hotel from the elevator. 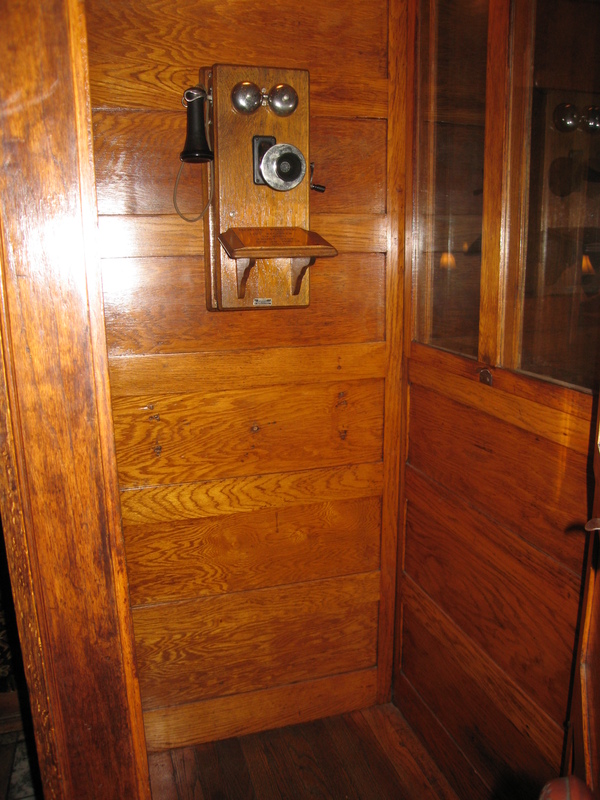 The Windsor Hotel Still Has its Original Phone Booth! The hotel is gorgeous – the renovation did a good job of preserving the historic features of the hotel, and was nicely appointed with a down duvet (actually a bit hot for the weather though!). We enjoyed our stay, having dinner in the pub restaurant, where I had the best fish burger I’ve ever eaten! The patty was made from lobster, crab and fish, and was just full of big chunks of seafood! Jon had the salmon satay with apple slaw, which was also delicious. We sat out on the pub’s second floor veranda and watched the thunderstorm from beneath the veranda roof. The lightning was incredible – it was so close and we had an excellent vantage point! It was a nice end to a great day. The Kitties are Hot… But the Chehalem is Chilled! Today it reached a whopping 87 degrees, which is pretty darned hot here in the Northwest. Of course, this week at work has been insanely busy, so mostly I spent the days inside in the air conditioning, except for a couple one block strolls to meetings in other buildings. But since our house doesn’t have air conditioning, it is much hotter at home than it is at work. Today when I got home it was 80 degrees on the first floor, and hotter upstairs where our bedroom is. The kitties are stretched out on the bed looking like they are going to melt. I feel badly for them, because they are furry and can’t get any more naked than they already are. But I didn’t feel sorry enough for them to offer them any of my Chehalem 2010 3 Vineyard Pinot Gris. I wasn’t going to offer Jon any either, but he just took some! The winemaker’s notes say, “from a cool, low-crop vintage, there are exotic tropical fruit, jasmine, pear juice and papaya aromas and flavors, and racy lemon sorbet and spice palate impressions, set on-edge by great acidity and perfectly balanced minor residual sugar. Perfect food wine.” It got a score of 90 from Robert Parker’s Wine Advocate, if the scores are something that interest you. On the nose, this wine has a nice, light minerality combined with sweetness. It tastes of Golden delicious apple and pear. It is fantastic on it’s own or with food. In fact the only negative thing I can say is that the bottle is almost empty!